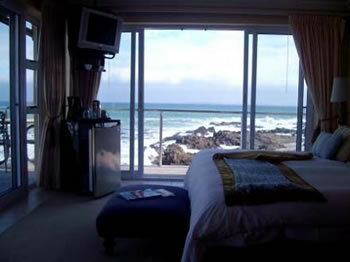 Southern Africa has some amazing scenery and the accommodation to match it. Here are just a few of the fantastic guesthouses we use on our tours. A beautiful owner run establishment where you will feel like one of the family. Set on the main road leading into the town this four star rated guest house is situated just a few minute walk from the town centre which offers many places to dine. The Auberge Burgundy, which is set above the picturesque Old Harbour, in the historic heart of Hermanus (the hub of the famous Whale Route) is a charming çal style guesthouse with fragrant courtyards and stone terraces. Cul de Sac is situated in the heart of the Klein Karoo, nestled between the breathtaking Swartberg and Outeniqua mountains. 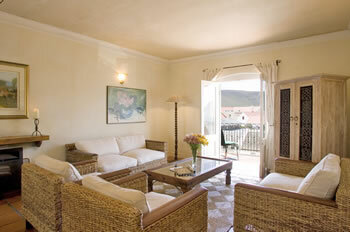 Cul de Sac ensures relaxation in a peaceful environment and is within walking distance from the town. 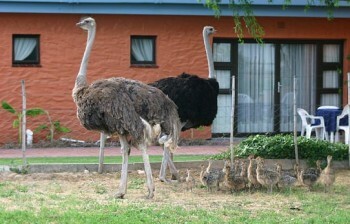 With a stretch of agricultural land bordering the guesthouse, you’ll view the Ostriches that made Oudtshoorn famous from the comfort of your room. We will let the video speak for itself on this one. This 4-star camp is a green oasis in the bush. There are only six African Rondawels and two Family Lodges, ensuring the luxury of a small and intimate camp. 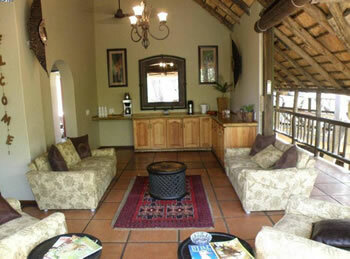 The Lodge is newly renovated and offers a wonderful base for your safaris. 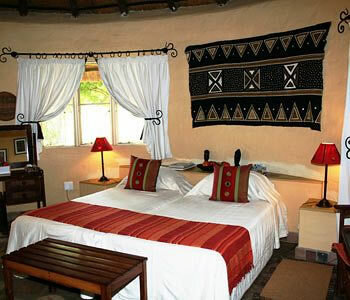 The Lodge is nestled under age-old trees with a panoramic view over the bush and onto a well-frequented waterhole. The shady lawns, with chaise lounges, create a wonderful scene of tranquility. The entrance is a thatched portico leading onto a lounge, bar and dining area. Alma’s spectacular Curio shop offering locally made souvenirs is well worth a visit too. Our Boma is a reeded enclosure with a crackling log fire, where sumptuous dinners are served. Moholoholo (“The Very Great One”) is ideally situated for day excursions to the Kruger Park (Orpen Gate ± 60kms,) Blyde River Canyon, Bourkes’s Luck Potholes, Pilgrims Rest, Graskop, Sabie, each place known for either their beautiful waterfalls, views, history, shops (± 230kms for a round trip). Khamai Reptile Park (15kms), Hoedspruit Endangered Species Centre (16kms), Echo caves (±45kms), Bombyx Mori Silk Farm (±6kms), all a wonderful experience! The superb position and number one view in the world make Pinard On Sea Neighborhood Boutique Hotel, in beautiful Bloubergstrand, a unique, exclusive destination for discerning guests. Enjoy privacy in one of three luxurious beach suites: Lo Tide, Mid Tide or Hi Tide. Families and larger groups stay in two spacious beach apartments: Seaside and Seaview. The Retreat is a Victorian farmhouse set in 560ha of the beautiful Groenfontein Valley Conservancy, bordering on the 129,000ha Swartberg Nature Reserve. The house, filled with yellow-wood and mellow Oregon pine, has a lounge and dining room – each with its own ceramic fireplace to keep them cosy on chilly winter evenings – leading onto a wide verandah, overlooking the sweeping gardens and majestic Swartberg mountains. 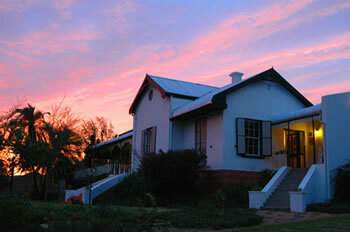 The Retreat has a full liquor licence and carries a selection of fine wines of the region. 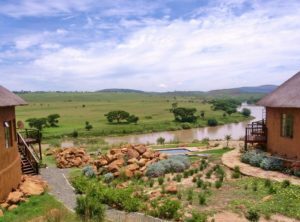 Rorke’s Drift, famous, infamous, but delightful, is an experience not to be missed. Located on the battlefields of kwaZulu-Natal, South Africa, this little hamlet has seen some of the most significant moments in South Africa’s history. The Battle of Rorke’s Drift in 1879 was a part of the Anglo-Zulu war that saw the first defeat of the British Forces by an imposing Zulu Impi in the morning at Isandlwana and a complete turnaround in the evening of the same day at Rorke’s Drift. Northern KwaZulu Natal has many natural and splendid beauties, but little can compare with the superb wildlife to be seen on the shores of Lake Jozini (also known as Pongolapoort Lake). 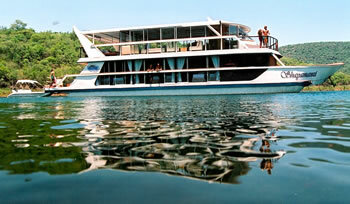 On board Shayamanzi Houseboat, soak up the stunning scenery of the Lebombo Mountains and Pongola Game Reserve. Enjoy calm serenity on the water or the thrill of Tiger fishing!